The first wintry cold front to hit the Highveld last weekend gave competitors at the second leg of the Dual Bike Challenge plenty to sweat over. Unseasonal heavy rain and chilly conditions may have driven most Gautengers indoors, but not these guys. 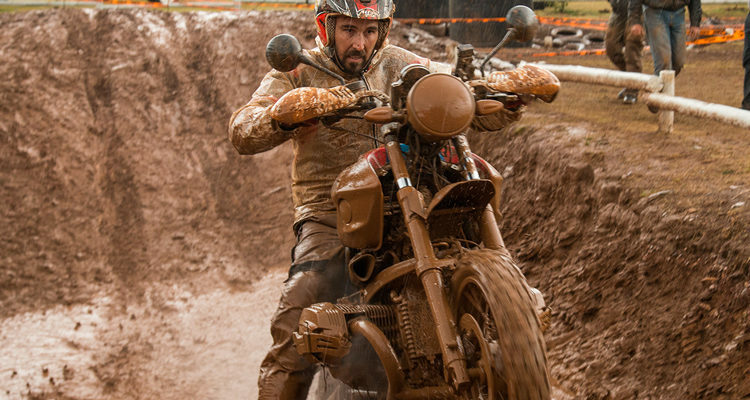 Slipping and sliding, the regular dropping of bikes and umpteen tumbles into the mud became the order of the day as everyone dug deep to negotiate the precarious, waterlogged course. In short, as far as these gung-ho adventure riders were concerned, they had a blast! Picking up the many off-road biking skills required to confidently explore the many natural gems our country has on offer isn’t easy. 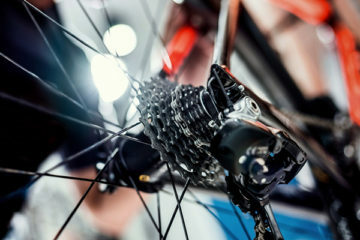 You need to understand your bike and practice riding in different, often difficult terrain and conditions if you want to prepare for every eventuality. Hooking up with more experienced dual purpose adventure riders, picking up tips and learning from their mistakes helps, too. As does a healthy dose of encouragement from others when the going gets tough and quitting just isn’t an option. Fortunately, this is exactly what the Dual Bike Challenge 2017 provides. The idea behind this national off-road series, now in its second year, is simple: Give all levels of dual purpose adventure riders in the country an equal chance to participate in categories that suit their abilities, as well as allow instructors and professional riders the opportunity to participate. And it works. Competitors wanted to improve their riding skills, and the wet weather allowed them to do just that. For the novice, the chance to shoot the breeze with more experienced riders, then watch how they handle the same obstacles that stumped you, is an opportunity not to be missed. Those planning future trips get a chance to hone their skills before heading off on their next adventure. Competitive riders can showcase their skills and work on climbing the series’ rankings. Then there’s the sheer fun of it all, were you get to hang out with similar folk who are as crazy about the outdoors as you are. Plus plenty of willing hands are available, should you get stuck and need to call in the cavalry. Just as importantly, events are fun, non-threatening, social and supportive, and every dual sport bike 600cc and larger is welcome. Open Class (instructors, pro riders, racing licence holders – men and ladies). Masters (men and ladies above 50). Men’s Club (all ages under 50). Ladies’ Club (all ages under 50). Before each event starts, names get randomly pulled out of a bright green NavWorld bucket to determine the riding order. And competitors accumulate points at each event, much like the Moto GP Points system. The Series comprises 8 events, held throughout South Africa. To qualify for the final event, competitors must participate in at least three. And, at the end of the series – taking place at ADA Hartbeespoort on November 18 – some great prizes are up for grabs. The first big cold front to hit the Highveld this winter set the stage for the second leg of the Dual Bike Challenge (DBC), held at ADA’s Training and Outdoor Centre, Hartbeespoort. The Friday before the event, unseasonal heavy rain hit Gauteng, and snow in Lesotho caused temperatures to plummet. By Saturday conditions were no better; it was bitterly cold, the low clouds dark and broody, with sporadic showers, some quite heavy, occurring throughout the day. Every now and then the sun would break through the grey, causing the soft mud and accumulating surface water to sparkle. Nearly all competitors had trouble negotiating the mud pit, which just became more treacherous as the rain continued to fall. Before even one bike had attempted the course that morning, it was clear to all that riding was going to be tricky. The soggy, muddy ground was almost as slippery as an ice rink – even walking across some areas of the clearly demarcated course was a challenge, let alone riding it on two wheels. Comments jokingly made by some competitors while walking the course proved to be right – in no time, knobbly tyres ended up clogged with thick mud, offering their riders virtually no grip at all. The first few riders to complete the course had it relatively easy. Even then, they experienced their fair share of spills, as they either got stuck trying to exit the mud pit, or tangled themselves up in the Garmin tyre trap. 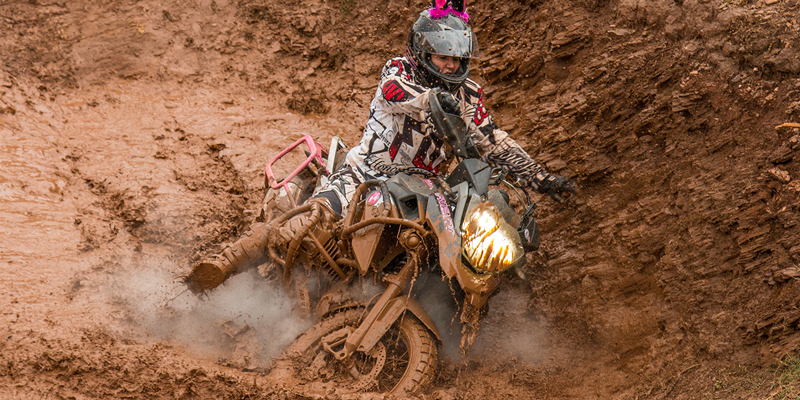 But, as the day progressed, as more rain fell and more riders churned up the track, the mud just got thicker and deeper. It got to the stage where the course became so slippery in many areas that only the most experienced riders could expect to make it around and remain upright. For the rest – which was nearly everyone – it became a hands-on lesson in momentum, sliding, braking and balance. Or, if you like, slow motion crashing and recovery. It didn’t take long for many bikes, and a good few riders, to look as if they’d been spray-painted a uniform SANDF camouflage brown. By the afternoon, the track became so slippery in places that only the best riders managed to complete the course without falling. By the afternoon organisers decided to cancel the skid pan section of the competition, as conditions were deemed too bad. Instead, they got the top three men and women from the morning’s session to ride it out on the course again – this time in the opposite direction, to determine who would be placed where in the day’s rankings. No one complained, it gave us all an excellent chance to watch some seriously hot riding. And, as they rode the course in the opposite direction, their entry and exit lines for all the obstacles were as unfamiliar to them as they were to us spectators, which made things even more interesting. The weather may have been cold, wet and grey, but spirits were high. And, while the crowd, huddled under the sponsors’ marquees next to the track may have been small, it made itself heard. Appreciative cheers and clapping followed every slippery obstacle conquered. And shouts of encouragement egged on riders who were stuck and still battling to make it through. No competitor walked away disheartened. There were so many spills that it became the norm of the day. 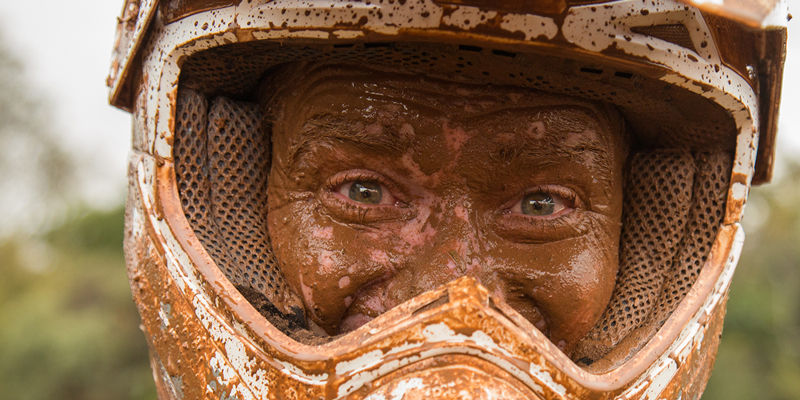 As a consequence all riders, man and woman alike, entering into the spirit of things – taking their falls humorously on the chin, then tossing their mud-splattered goggles aside and continuing. It was all a heck of a lot of fun. 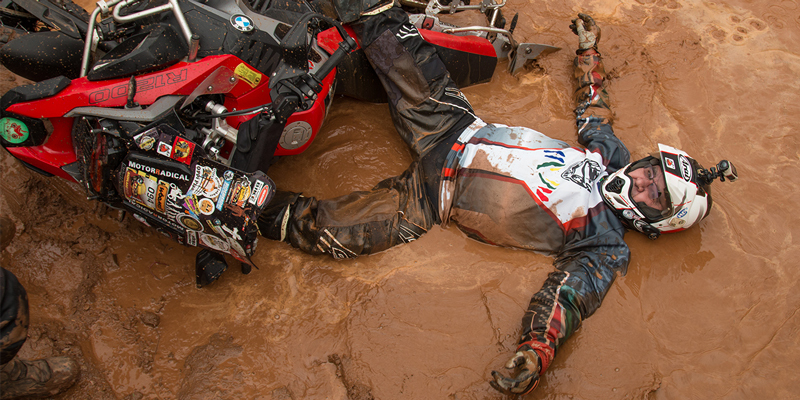 Just another spectacular wipe-out in the mud pit that dominated the day’s competition. At the end of the day, it’s hard to say who worked the hardest. The riders, who faced almost insurmountable odds, or the merry band of marshals (many of them spectators, just chipping in) – who had to keep retrieving fallen bikes from the various obstacles time and time again. But which ever way you look at it, the sense of comradery was palpable. It was as if the bad weather and demanding riding conditions had turned the competition into a cool bonding experience for all. Fortunately, the mud made landings really soft, so no one got hurt during any of their tumbles. However, one unlucky chap slammed hard into the right wall of the mud pit, snapping his instrument console. That nothing else got bent or broke throughout the day is astonishing – it just shows what kind of punishment dual purpose bikes can take when it’s expected of them. One thing’s for sure, though – every competitor who entered this leg of the Dual Bike Challenge rode away a better rider. Before long, many riders and their bikes looked as if they’d been spray-painted uniform SANDF camouflage brown, but that didn’t stop anyone from having a great time. 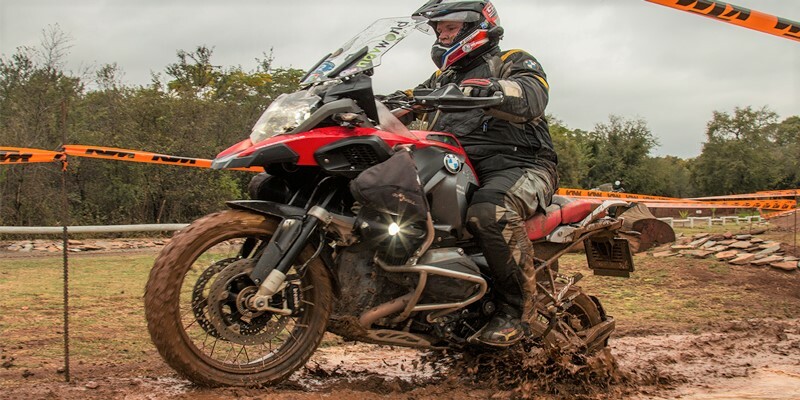 The Dual Bike Challenge (DBC) series was initiated by the proudly South African riders group Adventure Riders SA, in conjunction with top off-road riding and training facilities, iRide and ADA. Adventure Riders SA, which has an active membership of over 8 500, is the organiser and administrator of the series; and it’s managed by Treffon Smith and his team. 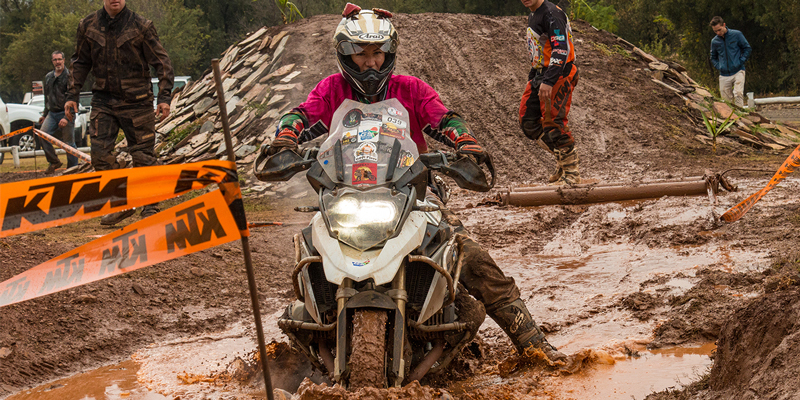 It’s a national off-road series of events aimed at dual purpose motorcyclists wanting to experience the various challenges typically encountered on adventure trips whilst travelling off the beaten track. 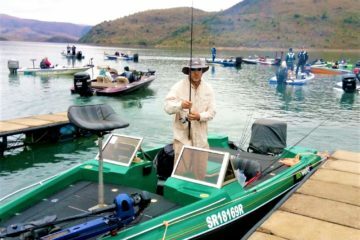 The DBC Series was launched at the annual LDBA adventure riding event held in Badplaas on 25 March, and ends 18 November at ADA, Hartbeespoort. In between, other events take place in Mpumalanga, Gauteng, the Western Cape and KZN (see table below for details) – using the host facilities of the ADA Outdoor Centre, RAD Moto and Terra Topia Adventure Park, as well as adventure riding events such as LDBA and NDBA. All event hosts are responsible for the design and build of their own unique adventure tracks. Everything is done under the strict guidelines of Adventure Riders SA, and gets overseen by events co-ordinator Andre Visser. Riders interested in competing need to pay an annual registration fee of R150, and a further R350 per event. The first 10 riders to enter each event all go into a lucky draw on the day. And the rider who has attended the most events and points in combination, will receive a “noteworthy prize” at the final event. However, organisers stress this is a separate award, and has nothing to do with the finals or the series’ end results.